There are three distinct coastal fields to the north of the Village which give it a valuable green setting together with the National Trust land of the Barrows field and the cliffs to the west and south towards Half-moon Bay..
1. The small field to the north of the lower part of Knowlys Road and east of the village was known as Cranmer’s field in the 1990s. On the 1838 Tithe Map it was a single unit of land belonging to the Rector and was called Cable Kin, a name for which we have found no explanation..
2. The much bigger field to the north of the main part of Knowlys Road where visitors and residents park to admire the view over the Bay to the Lake District fells. a view very like what J M W Turner sketched on his 1816 visit to Heysham. His painting Heysham and Cumberland Mountains is in the British Museum.. This field is now owned by a consortium of frontagers who have called it Lindale Meadow, a name from the 1838 Tithe Map. 3. A field to west of houses in Twemlow Parade, at some time called Whinnysty Green which in the late part of the 20th century was a pitch and putt course and owned by the City Council. The large second field has at least twice been the subject of potential housing development. We have seen a letter written by the Town Clerk of what was then Morecambe and Heysham Town Council stating it was being considered for compulsory purchase. In 1991 a proposal for a development of 76 houses was rejected by Lancaster City Council but following an Appeal against that decision was the subject of a public enquiry by a Government Planning Inspector, who upheld the Council’s decision . An extensive campaign against the development by local residents was the catalyst for Heysham Heritage Association.. Following on from their purchase of the Barrows Field and St Patrick’s Chapel from the Diocese of Blackburn the National Trust were poised to try and buy Cranmer’s and Rayner’s Fields After a Neighbourhood Council meeting which they attended a completely erroneous press report was published which stated the Trust were proposing development on their land. As a result they withdrew their interest. 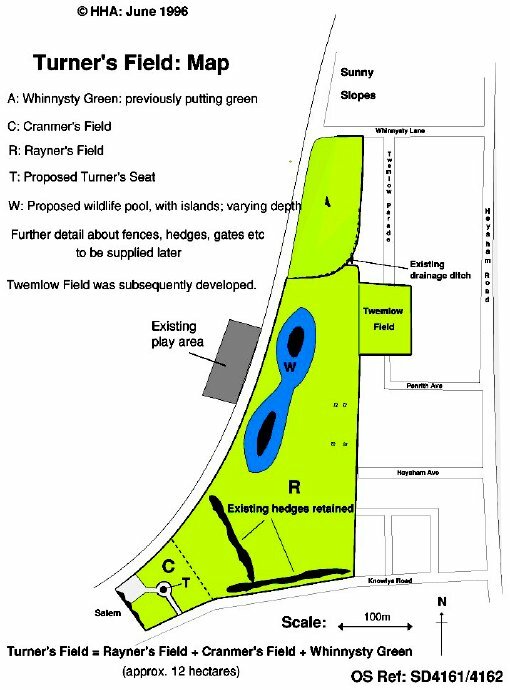 Meanwhile Heysham Heritage had produced a plan for the fields under the heading Turner’s Field. (right). 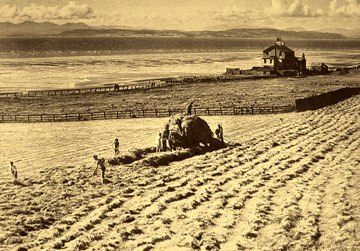 This was a well known building which held a dominant position in the Coastal Fields and we do not know the date the first building on the site was erected. 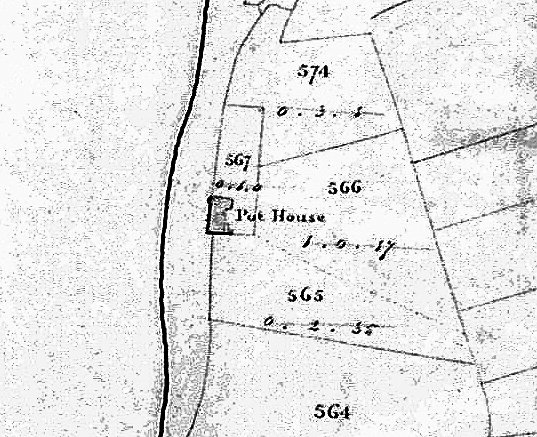 It was called Pot House on the 1838 Tithe Map of Heysham. 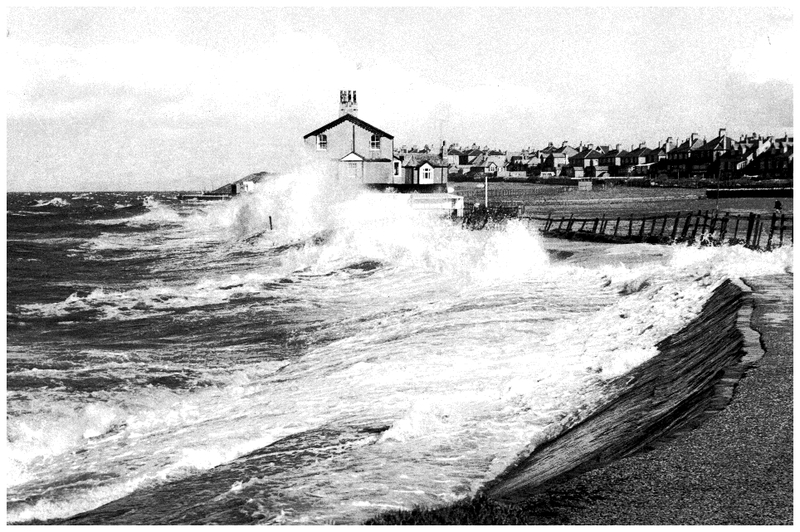 Unlike most oither outlying buildings in Heysham it was very close to the high tide mark and a s a consequence in stormy weather was subject to the mercies of wind and water as the picture below left demonstrates. Most of the other uoutlying buildings. chiefly farms, were built in the lee of higher ground. This unattributed image (c.1935?) of the Pot House, or as it was known in the later stage of its existence, Bay Cottage, was published in The Heysham Peninsula by Heysham Heritage in 2000 in a short section on storms; if you would like to read the full extract click here. The Pot House can also be seen in the first of Images of Heysham. reproduced further down this page on the right. (i) a place where pots are made. There was an 18th century pottery making Delft ware and known as a pothouse (no hyphen) at the seaward end of Lancaster Quay. (ii) a tavern. At some point in its history the Heysham Pot House was known as the Pot House Inn. 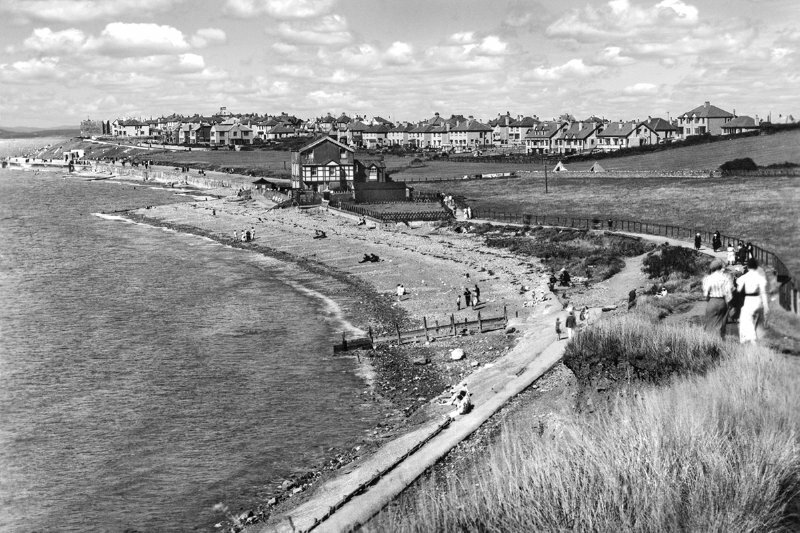 It was demolished in the late 1960s and the site is now a children’s play park. To the left is a very small section of the Heysham Tithe Map (1838). The thick black line probably marks the mean high tide level. Plots 565, 566, and 574 are all labelled Pot House meadow. 564 is part of the larger Lindale Meadow. The owner of the Pot House is listed as Henry Calvert but the occupier is Robert Hadwen. However the three Pot House meadows and Lindale meadow are all owned by the Rector (glebeland) with a rent payable to him by the occupier. Further exploration of the St Peter’s records suggest that her parents, John Hodgson and Mary Blackow, were married in 1808, and that Elizabeth was married in 1837 to Simon Gerrard, a blacksmith. The Pot House we see on the images on this page ais not the original building on the site. That was demolished by a storm in the early 1850s. The following account is from an as yet unpublished annotated version of the (1913) writings of Baldwin Bent, a local amateur historian who was the resident engineer during the construction of Heysham Harbour.at the beginning of the 20th century. He was also a member of the Wright family of Heysham Lodge. The buildings are said to have been a little seaward of the ‘present house of John Hatch’. One person who was rescued is a Mrs Calvert ; in 1838 the house was owned but not occupied by Henry Calvert as above. In the 1881 census for Heysham, Bay Cottages (2) are listed as ‘uninhabited’. In the 1901 Trade Directory (W J Cook) of Lancaster District there is a reference to the ‘Pot House Inn’ with the occupier being John Hatch. At some point before a great storm of March 1907 it was converted into two cottages, South Cottage (nearer the village) and Bay Cottage. In the Trade Directory (t T Bulmer) of 1912 (pub.1913) John Hatch is listed as a J P and timber merchant with two addresses at the Harbour (Lancaster?) and South Cottage, Heysham. There is also a John Hatch junior who is head master of St Thomas’ School, Lancaster with an address in Aldcliffe Road, Lancaster. Whether this is a relation of the Heysham John Hatch has yet to be determined. James David Hatch, 24, son of John and Margaret Hatch of Heysham, is on the Lancaster Military Heritage Group WWI Roll of Honour. He died in August 1918 and is listed in Baldwin Bent’s Roll of Honour ‘Men of Heysham’. In 2016 our correspondent Sheila Gilbert has told us that one of her two pairs of grandparents rented Bay Cottage during World War 2 with their family and that her own parents were married in St Peter’s Church. The image below dates from the mid 20th century. This version has been restored by Steve Smith PrintsAlive. The present route of the coastal pathway is slightly different from what you see here. There are also some buildings in the field inshore of the Pot House which were removed prior to the demolition of the house. The children’s play area which eventually followed after Bay Cottage was demolished was created and maintained by Lancaster City Council for many years but eventually, due to Government cuts in local authority expenditure, by 2016 it was neglected and in a rather sorry state. That should now change since the recent formation of Friends of Bay Cottage Play Park.who haved embarked on an ambitious plan to raise £200,000 needed to create an accessible seaside themed play park with new equipment etc to encourage imaginative play. A wild garden and sensory planting area are also planned. Construction of the new park will be in 3 phases with completion of phase 1 due by March 2017. For information of how to help contact Kirsty Chekansky. 2017: The work has now started and there is a temporary exhibition at Heysham Library about the site. Later in the year the new play park was opened by the Mayor..
Further work was necessary in early 2019 to improve drainage and the park is open again..